Bring a large pot of salted water to a boil. When it’s boiling, add the pasta and cook al dente. When it’s almost done cooking, carefully ladle 1 cup of the pasta water into a heat-safe bowl, mug, or measuring cup and set aside. *It is important to use freshly grated cheese; pre-grated cheese is coated in a powder to prevent the shreds from sticking to each other and does not always melt very well. 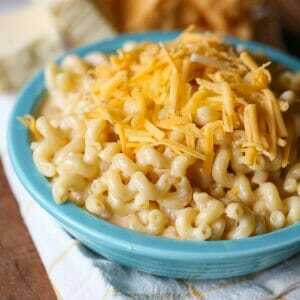 **Parmesan is optional; it adds some dimension to the flavor of the mac & cheese, but it is a little strong and may impact the overall texture of the finished dish.